1)	To the supreme controller, who possesses and eternal form of blissful knowledge, whose glistening earrings swing to and fro, who manifest Himself in Gokula, who stole the butter that the gopis kept hanging from the rafters of their storerooms and who then quickly jumped up and ran in retreat in fear of Mother Yasoda but was ultimately caught - to that Supreme Lord, Sri Damodara, I offer my humble obeisances. 2)	Upon seeing His mother's whipping stick, He cried and rubbed His eyes again and again with His two lotus hands. His eyes were fearful and His breathing quick, and as Mother Yasoda bound His belly with ropes, He shivered in fright and His pearl necklace shook. To this Supreme Lord, Sri Damodara, I offer my humble obeisances. 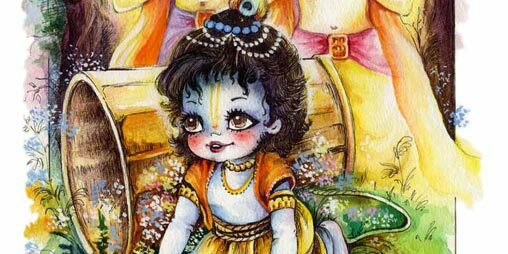 3)	Those superexcellent pastimes of Lord Krsna's babyhood drowned the inhabitants of Gokula in pools of ecstasy. To the devotees who are attracted only to His majestic aspect of Narayana in Vaikuntha, the Lord herein reveals: “I am conquered and overwhelmed by pure loving devotion.” To the Supreme Lord, Damodara, my obeisances hundreds and hundreds of times. 4)	O Lord, although You are able to give all kinds of benedictions, I do not pray to You for liberation, nor eternal life in Vaikuntha, nor any other boon. My only prayer is that Your childhood pastimes may constantly appear in my mind. O Lord, I do not even want to know your feature of Paramatma. I simply wish that Your childhood pastimes may ever be enacted in my heart. 5)	O Lord, the cheeks of Your blackish lotus face, which is encircled by locks of curling hair, have become reddened like bimba fruits due to Mother Yasoda's kisses. What more can I describe than this? Millions of opulences are of no use to me, but may this vision constantly remain in my mind. 6)	O unlimited Visnu! O master! O Lord! Be pleased upon me! I am drowning in an ocean of sorrow and am almost like a dead man. Please shower the rain of mercy on me; uplift me and protect me with Your nectarean vision. 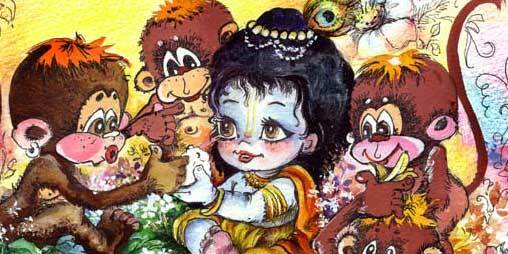 7)	O Lord Damodara, in Your form as a baby Mother Yasoda bound You to a grinding stone with a rope for tying cows. You then freed the sons of Kuvera, Manigriva and Nalakuvara, who were cursed to stand as trees and You gave them the chance to become Your devotees. Please bless me in this same way. I have no desire for liberation into Your effulgence. 8)	O Lord, the entire universe was created by Lord Brahma, who was born from Your abdomen, which was bound by a rope by Mother Yasoda. To this rope I offer my humble obeisances. I offer my obeisances to Your most beloved Srimati Radharani and to Your unlimited pastimes. Once mother Earth known as Bhumi, assumed the form of a cow. who were really demons, but were posing as the rulers. and they should all remain there to assist Him. your sister's eighth child will kill you!" How is it that you are so infuriated you are prepared to kill your sister? On this auspicious day, why should be so afraid of death? Why should you be so afraid of death? Kamsa, please consider you have no danger from your sister. the danger is to come from the eighth-born son of Devaki. Why should I accept this child unnecessarily? You can take him back---you can take him back. from the mind of Vasudeva within the prison of King Kamsa. I will await the inevitable future, and then kill the baby when He is delivered." to love Them as their sons. 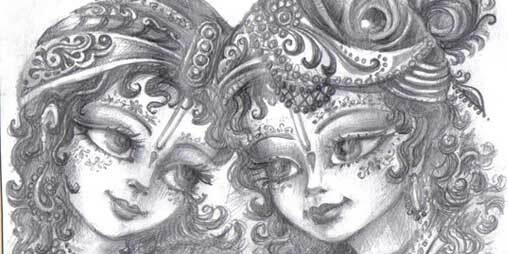 The Gopis said, “Oh no no! What else is there I ask you? Never bored and never blue. Serve Him with your life and soul. 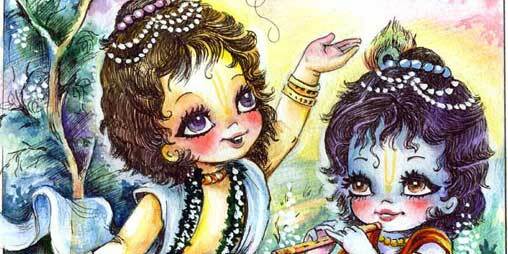 I love you Krishna, I love you. Let me serve you Prabhupada, eternally. I love you Prabhupada, I love you.